Julia Maxton can’t imagine anything worse than losing one of her three daughters—until the day seventeen-year-old Haley runs a stop sign, killing her younger sister Caitlin. Six weeks after the crash, the family is falling apart. Julia struggles not to show hostility toward Haley, but her deep-rooted anger won’t go away. Her husband, Ben, has drifted away emotionally. Their youngest daughter, Izzy, is lost in the shuffle. And despite Haley’s insistence that she’s fine, her actions scream otherwise. Fearing that she’s about to lose a second child, Julia decides to take Haley on a cross-country drive. Maybe somewhere between Nevada and Maine they can bridge the gulf between them. But first there will be painful questions to face—is Julia a good mother? Did she secretly love responsible, respectful Caitlin more than defiant Haley? Can Haley ever find peace with her mother—and herself—again? In Colleen Faulkner’s most thought-provoking and complex novel to date, an unthinkable tragedy becomes the starting place for a powerful journey toward healing and hope. Honest and unforgettable, Julia’s Daughters explores the surprising ways that families—even the most fractured—can save each other, over and over again. Colleen Faulkner writes books that feature strong women going through difficult circumstances. 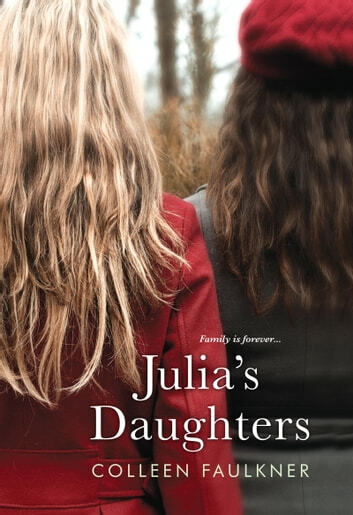 The themes of Julia’s Daughters are quite heavy: grief, guilt, failure to live up to others’ expectations, but those are balanced out by true comic relief in the interactions between these complicated characters. I enjoyed the book. It made me think long after I finished it. And there’s no higher compliment than that. Highly recommended. I really enjoyed this book. It covered how each family member dealt with the accidental death of a daughter/sistet. I just finished reading Julia’s Daughters by Colleen Faulkner. Julia Maxton just lost her middle daughter, Caitlin. Julia has been grief stricken for the six weeks since her death. Haylie is the eldest daughter at seventeen. She was driving the car with Caitlin inside when she went through a stop sign and into a truck (she did not see it). Since Caitlin’s death she has been acting out and has now been expelled from school. The youngest daughter, Lily has not talked to Haley since Caitlin died. Ben, Julia’s husband has been very distant since their daughter’s death (he talks more to his mother than to his wife). Linda, Julia’s mother-in-law believes that they should send Haley away to boarding school. Julia does not feel that is a solution. Then Julia finds out that Haley is cutting herself. Julia knows that she now has to climb out of her bed and do something before it is too late. She decides to take Haley on a road trip from Las Vegas (where they live) to her best friend’s home in Portland, Maine. Ben does not support the decision especially since Julia plans on leaving Lily at home (she has school). As Haley and Julia are departing, Lily begs to go with them. Lily ends up going on the trip (and sneaks Mr. Cat in as well). Julia is hoping this journey will bring her closer to her daughters and help them to heal from Caitlin’s death. She is hoping that being away from the town where Caitlin died and the memories in the home will be helpful for all of them. Julia asked Ben to come along, but he refused (this does not bode well for their marriage). Will this journey work out that way Julia hopes? What will the future hold for the Maxton family? Julia’s Daughters is a story about healing and overcoming grief. Julia and her daughters needed this journey to help them move on after the death of Caitlin. Julia’s Daughters was a very slow moving novel. I liked Julia’s commitment to her children. She did what was needed for them and for herself despite what her husband told her (good for her). The one thing I did not like was that it was told from the perspective of Julia, Izzy, and Haley. It flipped back and forth. Izzy point-of-view was basically a waste of space (it did not help or enhance the novel in any way). I felt that the novel would have been told from Julia’s perspective alone. I give Julia’s Daughters 3 out of 5 stars (it was a satisfactory novel, but I did not like or love it). 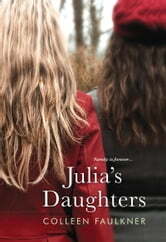 I received a complimentary copy of Julia’s Daughters from NetGalley in exchange for an honest review. Loved it! Made you realize how precious life really is. I hope as a mother I never have to go through what this mother had to. Although I know people that have lost a child I can't imagine the daily pain they must suffer. How do they continue on? I know I would have a very difficult time to live on without my children.